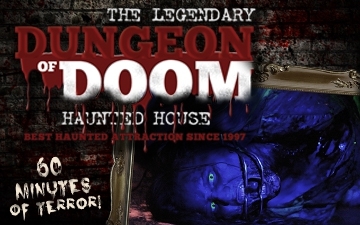 “The place where nightmares loom.” That’s what they all said about the Dungeon of Doom. Many brave souls have entered looking for scares, only to exit a shell of the person they once were. If you’re looking for “scares,” look elsewhere… but if you’re looking for an experience that will leave a dark stain upon your soul, then step forward to see the delightful nightmares that await you. You commit yourself to step inside the grounds of the Dungeon. Something inside you compels you to look back, hoping to see more revelers behind you or some semblance of society, but you can’t. To turn around will only confirm that you’ve abandoned the safety you once took for granted. To turn around at this moment will only make the terror real. Grasped tightly to the hands of your companions, you lock in with a white-knuckled grip that betrays the calm look on your face. The fetid stench of necrotic flesh hanging in the air around you, and you dare not let go. If you were to be separated from your friends, it could be the last time you ever see them… or they see you. Filled with a sense of helplessness, you soldier on. You have no choice now. You’ve come too far. Your body tightens as you pass through rooms filled with bloody viscera. Your pulse quickens. You can’t breathe… when suddenly you feel someone… or something… breathing down the back of your neck. Don’t turn around. It’s not real. It can’t be. You can tell they’re closing in on you now. You want to scream but fear the consequences. “The place where nightmares loom” they all said. The Legendary Dungeon of Doom, NOW located at the old Briquette Factory in Zion, Illinois, is not for the faint of heart. The Dungeon of Doom has earned its legendary reputation as the most bone-chilling, best haunted house in Chicago.